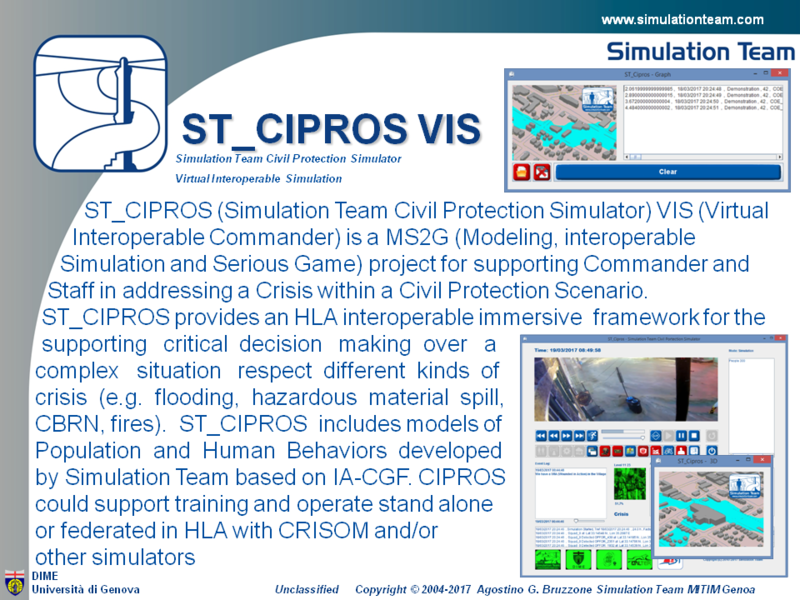 ST_CIPROS (Simulation Team Civil Protection Simulator) VIS (Virtual Interoperable Commander) is a MS2G (Modeling, interoperable Simulation and Serious Game) project for supporting Commander and Staff in addressing a Crisis within a Civil Protection Scenario. ST_CIPROS provides an HLA interoperable immersive framework for the supporting critical decision making over a complex situation respect different kinds of crisis (e.g. flooding, hazardous material spill, CBRN, fires). ST_CIPROS includes models of Population and Human Behaviors developed by Simulation Team based on IA-CGF. ST_CIPROS supports training and operates in multiple modes from stand alone to federated in HLA with other simulators. The system is integrated with CRISOM Simulator.